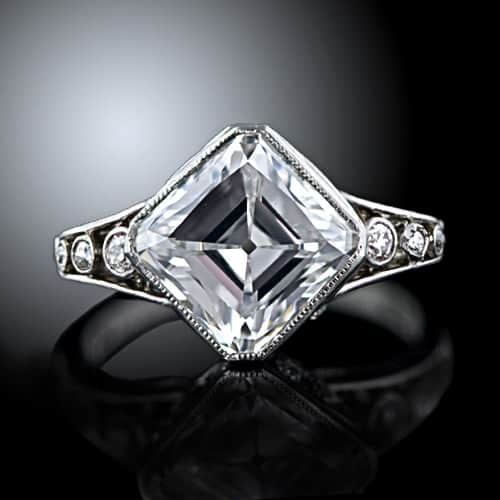 In 1902 the Dutch diamond cutter Joseph Asscher developed the cut that would carry his name on into the future. The square, step cut, design had been around for ages but the modifications Asscher implemented, two more rows of facets and a diagonal cross cut blunting the corners of the square, made the Asscher into a design that could be patented. This high crowned diamond cut, with perfect symmetry and 74 facets loses an additional 15% of the rough weight in order to gain the greater dispersion and brilliance associated with an Asscher cut. In 1980 Queen Juliana of the Netherlands awarded a royal title to the Asscher Diamond Company thus changing its name to the Royal Asscher Diamond Company and its patented cut to the Royal Asscher Cut.